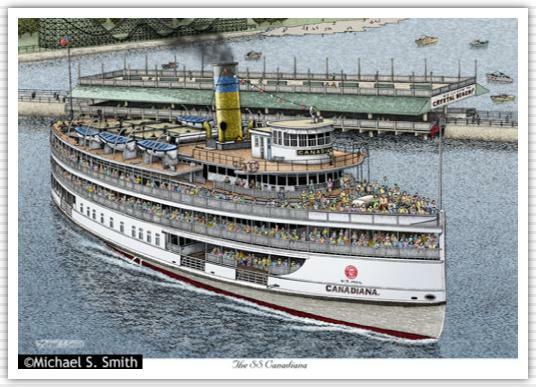 Known as "The Crystal Beach Boat", the Canadiana sailed from the Buffalo harbor on lake cruises and to Crystal Beach. Built by Buffalo Dry Dock Company in 1910, is has three decks with an original capacity of 3500 passengers as well as the largest dance floor of any Great Lakes steamer. During it's time, it was one of the area's favorite attractions and operated through the 1958 season. The boat was scrapped in 2004, but the engine and pilot house were saved for future exhibit in Buffalo.